Discussion in 'Conspiracy Theories' started by Mick West, Aug 27, 2018. On September 25, 2015 , John Podesta tweeted a series of tweets in support of the Global Goals organization. Global Goals promotes 17 Sustainable Global Goals adopted by the UN, with Sept 25 being the day they were formally adopted. In the tweet above, he's promoting #14 Life Below Water - "Conserve and sustainably use the oceans, seas and marine resources for sustainable development." Important but overlooked #GlobalGoals: No. 14-we must protect our oceans and the life they sustain. Great thanks will make that edit and send them out! The email exchange also included the image for her to post, so that image is also in Wikileaks. 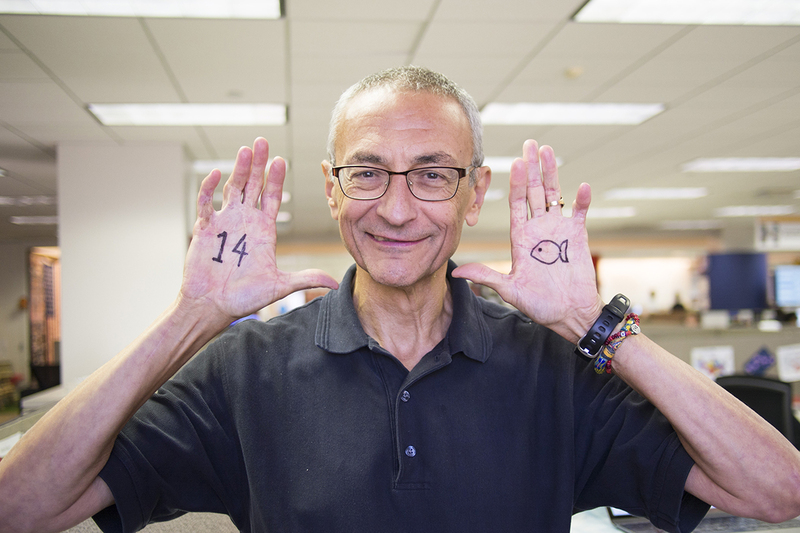 I've seen this picture http://i.imgur.com/pT5D46U.jpgJPG of John Podesta with 14 and a fish drawn on his hands explained in a bunch of different ways. All seemed quite complicated. Now I've found an explanation that is simple, makes sense and is evidenced. It comes after I recently read the Podesta wikileaks email https://wikileaks.org/podesta-emails/emailid/39459 that has 'Thelema Favor' in the subject line. It is a request from a friend of John to help someone meet Obama. In the body of the email the sender also terms the request as a 'Thelema favor'. This is not new to Pizzagate. As most know, Thelema is the cult religion founded by Alistair Crowley. Mr. 666 himself. Using the word Thelema in an email can't really be mistaken to mean anything else. Anyway, while reading up on Thelema, I came across their numerology guide. It corresponds to the Hebrew letters of the alphabet.http://www.thelemapedia.org/index.php/Gematria. The important note is that the number 14 is represented by the Hebrew letter Nun. The symbol of Nun is the fish. It's also worth noting that Thelema embraces many other occult and religious traditions such as gnosticism and tarot. The particular tarot card associated with the Path of Nun is the death card. The problem with the "obvious" explanation, which frankly pisses me off every time someone mentions it, is that EVEN IF he was talking about a bullet point on a memo, it is BIZARRE and CREEPY to write symbols on your palms, raise them up with a creepy grin on your face, take a picture, and then tweet/email it to the world. I'm a lawyer, I work with memos all the time, and I've never done anything like. Then factor in the band aid on his left middle finger. Then factor in the cannibal painting hanging in his office. Then factor in Thelema, Moloch, and Minerve in the Wikileaks emails. Then factor in Spirit Cooking. Then factor in that these are KNOWN to use code words and doublespeak in the public (like pedo images in store brand logos). 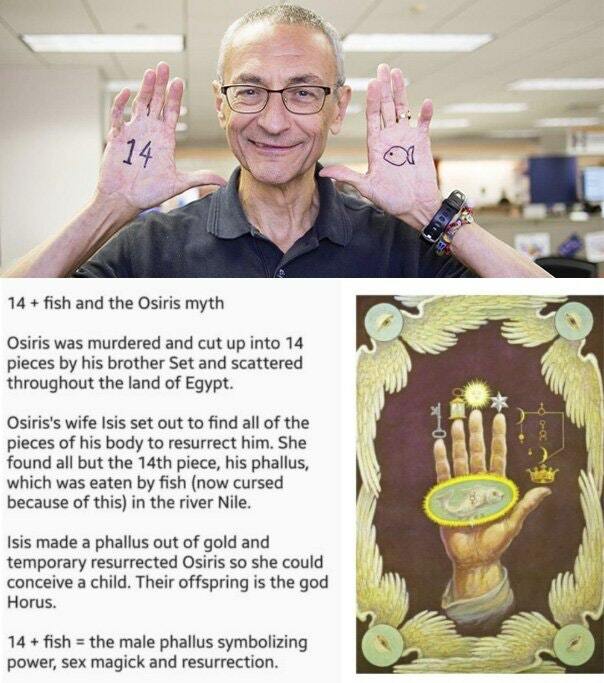 After you factor all of that in, the Thelema/Spirit Cooking explanation makes a lot more sense, even if Podesta is using the memo for plausible deniability. Little claims like this are obviously ridiculous when you know the context. But it thought it was still a good idea to put up a post with a more detailed explanation. Things are often re-cycled and can become part of a mythology where the origins are forgotten. I've seen people present the image as if it came from Wikileaks, not realizing it was a public tweet. So having an explanatory post with all the references might save people some time and effort later. There is all kinds of craziness being written about supposed 'hidden symbols' in otherwise innocent postings. The number 14 is supposed to be some White Supremacist symbol, for some absurd reason. Also, anyone using the number 88 is supposedly sending out a 'dog whistle' to other Nazis, because H is the 8th letter of the alphabet, and thus 88 represents "Heil Hitler." In the voat link in the op the guy goes on about Thelma in the email. Is there context behind why the email is titles Thelma? Dear Mary, Hope you and the family are well. Since John is no longer with the email address I have for him, would you please forward this "thelema" (favor) to John ? From the prolonged form of G2309; a determination (properly the thing), that is, (actively) choice (specifically purpose, decree; abstractly volition) or (passively) inclination: - desire, pleasure, will. Demos is a Greek name. So it seems likely he was using some allusion or colloquial term for "favor". The fact that he puts it in quotes, and then follows it with (favor) seems to suggest he's offering the definition of the word. Demos is also a historian who wrote about witch hunts, so he might also have been aware of Aleister Crowley's "law of Thelema" (law of will), "Do what thou wilt shall be the whole of the Law. Love is the law, love under will." "We know you are inundated with such requests but feel we had to give it a try." And 88 for, as you say, a coded reference to Heil Hitler; I've seen 88 on its own, but 14 only as part of 1488. There are a bunch of other not-so-secretly-racist bits, too; e.g., the Odin's Cross, the Valknut, Yggdrasil.